Aston and/or your instructor may have disabled certain tools within the system which means you may not see all the tools that are mentioned in Blackboards help system. Blackboard allows the option of customising the interface. The names for some items may be different from those used in this Help. For information about supported web browsers and operating systems, see Browser Support. A – Page header: The area at the top of the screen that contains the tabs, access to My Blackboard, and the link for Logout. B – Tabs: Aston’s Blackboard has two tabs, the Welcome page and your Module list. C – Global Navigation and My Blackboard: The Global Navigation provides you with a quick way to navigate around Blackboard. To learn more, see My Blackboard. E – Course-to-Course Navigation: Use course-to-course navigation to access all courses you are enrolled in. 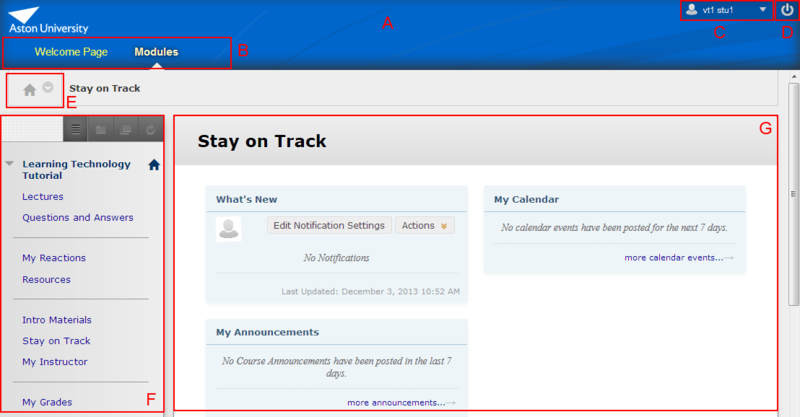 Click the Action Link next to the course title and select another course from the contextual menu. For example, if you are viewing the Discussion Board in one course and select another course from the contextual menu, you are taken to that course’s Discussion Board. In addition, breadcrumbs track the most recently visited pages within a course. F – Course Menu: The panel on the left side of the interface contains links to all course content, such as Content Areas, individual tools, web links, course links, and module pages. To learn more, see Course Menu. G – Content frame: The larger area of the screen adjacent to the Course Menu that displays the selected Content Area, tool, or material. Because Blackboard Learn is web-based, printing is handled through your web browser, or, if the content is an attached file such as a Text document, through that program.